I'm converting my Anet A8 to the AM8 in the next few weeks. Once I get that done, I'd LOVE to make this little printer. BUT, it seems the website is broken. The section for the printer seems to lead nowhere (404). Where can we get a hold of the detailed list of parts? The list of materials by the original maker was moved to this page. Have a look at this great instructable made by @fiveseven808 . Within it you can find lots of tips as well as a link to his BOM, which has a bit more info. Good luck building this great little printer and don't forget to post pictures of your build under "I Made One". Has anyone done a remix of this with 8mm rods? I have an old, non-functioning Duplicator i3 that I want to scavenge parts off of to make this little printer, but unfortunately it uses 6mm rods instead of 8mm. Or perhaps does anyone have the original CAD files so that I could modify them to use 8mm rods? I would like to use threaded rods with a lead screw. Does anybody know or have modified x-ends files ? Would it be possible to use stock hardware from an Anet A8 for this? It depends on the parts you would like to use. e.g. the the rods and threaded rods from the Anet are 8mm, there doesn't fit in the 3dtje. But the electrical parts should be no problem. What is the size of the print area? It's a mini printer - the area is about 10cm x 10cm. You can even get away with alot of error on this little print surface by printing with a raft. It doesn't need to be perfectly leveled. If you have any questions don't hesitate to look through thingiverse (just look for 3dtje) or ask here, many things have been improved or solved already! I've been busy recently with this exciting build (https://www.thingiverse.com/thing:2988527) but I think, I did everything I could on it. Now I'm focusing again on my 3Dtje. I made quite some changes, most recently replaced all bearings with Igus 6mm dry bearings and added clamps to the z axis smooth rods so they won't move around. Whoa great! must try it when i managed printing the parts and buy the other stuff and i'm ready to go! thank you so much! That's because it's virtually non existent. Most of these printers have a piece of mirror glued on with thick foam tape. You may find three holes in the bed that allow using some screws to tilt it a bit, but most times that's not needed. When I print I rub my finger over the priming brim that's printed when starting to print. If there is a large difference left and right, I just force one of the steppers a few turns. hi, i love this design and would like to build one. can you provide an updated and entire BOM? It is my little workhorse! Love it. I was no very happy with the printed Extruder from the 3Dtje, so I have created an Extruder bracket for normal Extruders. Be aware that not all Nema 17 types have the same pinout. I had to crossover 2 wires, to match the Ramps Pin Setup. A Nema 17 has 2 coils, if you are totally unsure about the pinning, check the combination of wires with a multimeter, measuring the reistance. If you find 2 wires, connecting a coil, the resitance will be low. Those motors will work fine. Sounds like your wiring is incorrect. Please follow the instructions in my previous comment on how to wire your motors properly. Hey guys the heated works fine, but what is the hotend thermistor setting for a Chinese j-head clone? I got the keepang j-head hotend from Amazon. What would the number be? Also, what order to I put the wires into the stepper ramps connector? The colors are weird, they are blue, yellow, green, and red. Thermistors vary, the one that came with mine didn't see to match any of the common profiles. Just pick #11 and fiddle with it if necessary. It's more important to PID tune your hotend and get something stable than to get accurate temperature numbers (which can be compensated for). As for stepper wires, plug em in any which way and keep swapping them around till you get the desired rotation/movement. It also mentions the colours on your steppers: "From left to right, wire all of the stepper motor's wires as red, blue, green, and black or red, green, yellow, blue into the pins next to the Pololus." If you're using RAMPS and that PSU you listed earlier, you would use the 12v side. 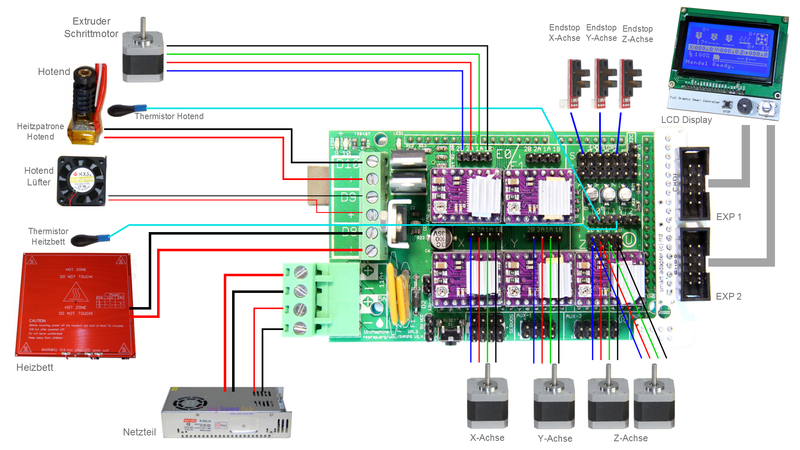 Hi, on this page is a picture of the standard wiring without heated bed. As I don't have a heated bed I can't help you much further. I suggest you to first buld the printer and leave the heated bed disconnected until you find your answer. The printer should print PLA fine without the heated bed switched on. Hey! This whole thing has me super excited ! I am however struggling a tad with the website , do you happen to do a parts kit minus the 3D printed parts at all please and if you would it be possible to grab a link at all please? Lemme know if you have any questions regarding this printer! I'm still super excited about it and am trying to put together a second one with as little pieces as possible lol. I love this little printer! Maxint has hit the nail on the head, and the relevant bits should be there! Can I use this heated bed on top of the original? If so, how do I connect it up to the ramps? Yes you can, however you would need to figure out how to mount it on the plastic platform, as there is currently no mounting provisions, and you wouldn't want to put this directly touching a PLA bed. But then where would a part cooling fan go? Currently this is about as good as it gets. It'll cool normal objects at [email protected]/s. If you print faster, you may want to use an external fan. I wish I could edit or do a pull request to a thing on thingiverse... I've created an instructable here that should be good enough to help people get started! Let me know what you think, things I missed, things I should change, etc. That way we'll have an easier way for people to put these things together! Thanks dude, I can just print the bed out of a more resilient plastic similar to pla. More heat resistant. I'm also looking forward to see the results of your work! I would appreciate if you could post pictures of your build under "I made one". Surely other makers will appreciate that too. Good luck building this printer! As mentioned before, building this printer forms a great learning experience and it develops skills that will benefit makers in other projects too. You have shown that even small imperfections in a design are no show-stoppers and they can inspire to builders to improve and reach for the top! Ahh, shoot I haven't yet uploaded a repaired/netfabbed version of that... When I printed it in Cura, I was missing the Z axis endstop screw hole, and I didn't understand how it went together since I didn't look at the model before hand lol. I ran it through 3D Builder to repair the model and it sliced and printed correctly. Glad you were able to get it to slice properly though! where can I buy the non-printed parts? Hi there, In my make of this printer, I've got some documentation and build notes, including this spreadsheet which has purchasing links to all of the "vitamins" that this printer needs! Good to have this list. I think those links will come in quite handy. I think you had quite a good deal on those parts. When my parts were bought they were at least twice as expensive. Well done! Thank you! I hope that this list can help others and grow this printer's community! I'm a little upset however that I spent more on parts for this 3Dtje (not even including the plastic lol) than the Anet A8 I used to print it! However, to make up for that I'm working on trying to improve my 3Dtje to the point where it outperforms the A8 in at least some aspects. More expensive? I thought your price was quite good already! Well, I guess the 3Dtje is more compact, more portable, maybe more precise (if you tune it well and install a smaller nozzle) and overall more fun! It's technically possible to buy an Anet A8 for $130ish (or possibly cheaper!) when gearbest has a sale :P I got the bill of materials for the 3Dtje down to $111USD ish, but that doesn't include the plastic required to build the printer. I was kinda hoping (and somewhat under the impression) that building a printer would be significantly cheaper than buying one! however I guess the price of printers has dropped drastically in the past 2 years where this no longer holds true. Yes, the learning experience is priceless. A few years back the difference between buy or build was massive, but also building was way more expensive then. Maybe it's a consolation that al together I've paid about 1000 euros. Over 600 for a Kickstarter mini-printer that offers much less (in fact awful) quality and about 450 for the 3Dtje. I've seen your videos on YouTube and the speed you achieved (at good quality) is simply amazing! I like your ambition to strive for the best. Keep it up! The non-printed parts are mostly the same as in a normal RepRap Prusa I3 printer. If you order locally delivery is fast, but prices are often 4 times as high or higher. Cheapest is to order parts from China, but you may need more patience and be lucky with the quality. The effort of searching and ordering parts is part of the fun! ;-) So enjoy! Good luck and don't forget to post pictures of your printer when its done! Running into issues with retraction (I think) and underextrusion due to jamming. Anyway, the issue is that during prints, when filament retracts, the extruder is unable to force the filament back into the heat break or something. If I try to push the filament through manually after a retraction, it takes way more force than I'd deem necessary to get filament flowing again. However, once it starts flowing, then it comes out fairly quickly. @Maxint: have you run into this issue before by any chance? The only advice I've been able to find that looks anywhere near useful is to make sure that my PTFE tube is cut perfectly straight so that it mates with the heat break without any gaps. All I need to do now is decouple the z threaded rods from the x axis and I'll have flawless prints! Oh, what I meant to say is that I still have to run at 230C because I'm pretty sure something is wrong with my thermistor/calibration. I'm still quite firmly in the part cooler camp. I started printing a marvin and forgot to turn on my external fan and the bottom half of him was completely screwed up until I turned it back on. I'll post pictures of the differences a fan makes. My experience so far has shown that it is not possible to print PLA with any sort of quality without a part cooling fan. I really need a part cooling fan to get decent prints (I mostly print PLA). A house fan blowing on the printer is not a good solution, especially since I want it to be portable. Since the print volume of this printer is quite small, what if we attach a pair of 50mm radial/blower fans on the ends of the X axis aimed towards the center of the bed? a 50mm blower should be able to push air with enough pressure to reach wherever the head may be without issues. It'll also keep the weight off of the X carriage which will help with print speed, and wont have to worry about decreasing print volume due to increased X carriage size. Anyway. I may work on an attachment for the X carriage ends to test this out. I can't think of any other way right now, with the limited space we have to work with lol. Hi, I only print PLA, but I've never needed a parts cooler. I don't use an additional fan and still my parts come out fine. See the picture of my printer with all those prints for illustration. I never add a raft; I seldom use support and my prints come out just fine. I once had filament that printed a bit droopy though. Maybe some filaments are lesser quality? FYI: most times I print at 205-210 degrees celcius. Whenever I see saggy overhangs I try a lower temperature, as low as 190 degrees. I ended up finding an absolutely perfect parts cooler yesterday! Seems to be working great!!! On the other hand, I also ordered a 40mmx20mm centrifugal fan that I now need to figure out what to do with when it arrives lol. Thanks for uploading your pictures. You're absolutely right with regards to the mentioned small overhangs. In most items I've printed I was satisfied with the result and if not, I'd use a file and knife to do some post processing. This evening I changed my filament to a lighter colour and printed the Marvin keychain. There are indeed some imperfections at the places you mention. Edit: see this make for a detailed picture of the Marvin keychain I printed yesterday. 1-There were two types of small bearings in the list: 688zz and 623zz that I still have not figured out where they go. 2- Also I am reusing the X, Y and extruder motors from an old 3d printer, and although they fit the positions for the screws, the motors are taller than the recommended ones on the shopping list so the feeder part is too short for the motor. Is there a way to get the original file so that I can make this part longer or does anyone know of a way to modify the stl file to make it deeper? I am really excited about putting this together. I have built 3 full printer kits for myself and my students, but this is the first time building one from scratch and using 3d printer parts. Hi Arddwyn, in regards to a taller motor for the extruder housing, what you can do is use a mesh editor like the built in Microsoft 3D Builder application built in to Windows 10, or meshmixer (I think? have not used meshmixer). 3D builder is what I use to modify all of my meshes with since I don't know how to use any actual CAD software. If you can tell me how big your motors are, and/or how long you want the internal cavity to be, I can make a quick edit for you. The smaller of the bearings are used for the tensioner/idler pulleys on the X and Y axis, however you can probably run your own idler if you already have them. (one of my belt kits came with them). The larger of the bearing is the tensioner/idler gear for the extruder. It goes on the tensioner arm and puts pressure on the filament and presses it against the extruder gear. This printer is super awesome! I'm getting some severe Z banding right now but, I'm not entirely sure if it's the threaded rods I'm using, or the horribly loose tolerances I have on everything else right now. Hi Arddwyn, nice to see you're making this printer too. I think it's a great little printer. I recommend you to read all the comments, as many questions other makers had were answered here already and there are lots of valuable tips to be found in the responses. Also keep close watch on the works of @fiveseven808. He's done great in his build and has gathered much information already. He has also posted some intermediate photo's and is working on an instructable. I haven't looked them up, but if these are the two small round bearings, each one goes in the two halves of the belt-wheel of the x and y-axis. A third round bearing is used on the clamp lever, to press the filament against the feeder wheel at the starting end of the bowden tube. The original files are not available. In the description of my modified clamp lever (see https://www.thingiverse.com/thing:2250966) you can find instructions of the method I use to modify STLs using SketchUp. The basic trick is to first remove all same-surface triangles before modifying the part. Good luck and have fun building this printer! I'm printing this thing now! I found the parts list, but I can't find the instructions. Are there some anywhere? Would greatly appreciate it, thanks so much for the amazing design!!! Hello. As far as I know there are no instructions such as an instructable. Would be nice though to have all build steps demonstrated in a video. Unfortunately I didn't take notes or filmed the construction when mine was build. In general the build of this miniprinter is comparable to that of a regular Prusa I3. Basically you first assemble the main parts (Y-carriage, X-carriage and Z-frame), check them individually and then bring those parts together. Be aware that you may need to adjust some things as depending on how you printed the parts you may need to use file and drill to improve how things fit. Read the comments below for more tips on specific details. Hi there, I was able to get someone else who did a make of this printer to help me with my specific issues. I'm thinking about posting my modified files and packaging them together and posting a remix of this since the original creator seems to have abandoned the project (no comments in over a year) and GPL license. I also plan to write a full instructable for this as I REALLY like this printer. Cutting a few rods very thin rods (if you dont already have them to length) is about the only thing you need to "build" vs other larger printers that require a lot of precise cutting with thicker (8mm, etc) rods or aluminum extrusions, or wood even! Always nice to hear that the printer is appreciated. I have been offline due to other commitments but still busy. The ultimate goals was to create a printable printer with minimal work to assembly. You're welcome to aks me anything. But due to my work at sea i'm regularly out of reach of the internet. Wow! Thank you for the response! I really enjoy the fact that your printer is not nearly as complex as something like the Snappy. I'm a little surprised more people haven't built this printer considering it's very easy to assemble (if you're familiar with i3 printers), and the frame pieces will fit in most i3 style printer's build volume! I will probably be asking you and Maxint more questions as my parts come in. Oh, forgot to ask: can you also make some pictures of your printer and add them via "I Made One" in the top right? It's always nice to see the makings of others and to know other people that share their enthusiasm for this printer. I can start posting what I have now if you're interested? All of the 3D printed parts are there, but I don't have the controller, and some of the other mechanical bits yet. IT LIVES! Check out the video I posted! I have a question since this is a comment anyway, but I'm getting some pretty bad but regular Z banding. Is this due to shoddy threaded rods? Shoddy Z axis nuts? Did you encounter this by any chance? I'll post more details in the morning. Sleep for now. Happy new year! Happy new year and congratulations! You've made great progress! On the occasions I saw banding it seemed related to bends in the threaded rods. If I compare your build with my printer and others, the main difference seems that your rods are protruding the top. As these rods are plain screws, not made of hardened steel, they will bend easier. In my printer they are cut off just below the holes. I can imagine protruding the top may cause extra tension in the rods. If you have some shorter spares, give those a try and compare the results (of course without changing any settings or using different filament). There may be other causes though, such as a loose belt, steppers skipping steps, irregular extrusion, etc.. You may need to print some other models for comparison. I found this guide very helpful in resolving common printing problems. Thank you! I believe you're right with the bending in the threaded rods. When my Z axis does a G0 fast move (and it moves quite fast lol) the whole printer shakes. Something was out of alignment or loose but I figured that the Z axis moves so slowly when printing, the belt tension would keep things tight when printing at a low speed. It makes sense that bent threaded rods would cause the wobble even at low speeds, and introduce banding during prints. I'll check on that tonight. Z banding aside, I'm quite happy with the print quality so far! It can only get better from here! Sounds like you're well on track. Keep it going! My first print wasn't perfect either and there are many settings in Slic3r that affect your final result. Speed of movements, extrusion rate, layer thickness, etc., they all effect the outcome. Sometimes little things can have large impact. I've had my own challenges related to first layer adhesion and filament friction. I've traced the issue to wobbling x carriage ends. Seems like I need more precise length x axis rods than I thought? Do you know how long I need to make those rods? The issue I'm having stems from the threaded rods tensioned and crawling around the top z mount causing the x carriage ends to twist every time it makes a z change throwing throwing the placement of the x axis off a tiny bit. As for an item to be printed, I'd be curious to see how low you can go on your own printer with a tolerance test such as the Maker's Muse one or this one https://www.thingiverse.com/thing:2318105 . I believe it should fit in the build volume of this printer. As I previously wrote: "The X-axis rods on my printer are closed in by the plastic. The holes on both end-sides of the X-axis are a bit filled with printed filament, so on the inside they were probably drilled out to provide a tight fit." I don't know the precise length (don't have my printer nearby at the moment), but the sliding rods should be long enough to properly fill the holes in the mounts. More importantly: they should fit tightly and not move. I cannot shift the mounted rods sideways at all. If the holes are too wide already you can try fixing it by putting some masking tape aroun the rod-ends. If your z-axis moves unevenly, twisting the x-carriage, you should first make sure that the z-steppers are not skipping steps. If bends in the z-screws cause too much friction, you should definitely fix that first. I would use the dremel not to enlarge the holes, but to cut the screw rods off just below the holes in the horizontal top part. As for the tolerance print; I've already printed a similar piece from the Make: magazine 3D printer test. In this picture you can see it in the middle right at the right edge of the picture). Maybe later coming weekend I can reprint and post detailed pictures. Ahhh, yeah, I'm pretty my sliding rods can move side to side in my setup right now, which means they're way too short. Maybe I'll try and pick up some new stock tonight and see if I can't redo them. My Z axis moves up and down very evenly, no motors skip. The issue is the threaded rods move around in the top hole as the rods turn. I plan to remove the holes completely when I get home today. Last night I printed a semi expendable Z top with 3/16" holes to accommodate my smaller than spec rods that I don't mind chopping up. It braces the guide rods I have quite well so I'm hoping it holds steady enough that I don't need to redo the X axis. Hopefully my 6mm rods get here soon! The difference between the tolerance test I linked, and the Make test is that the spinning tolerance test doesn't only test in the X and Y direction but tolerances between angled parts which usually require active cooling with PLA to prevent unwanted bridging via drooping. It is possible that the climate you live in is cool enough where active cooling is not needed, however I've found that it's quite necessary when I print things. Okay, while you're at it also try to make the x-sliding rods fit more tighly in the openings so that the carriage assembly forms a stiffer unit. Good luck fixing your rods. I don't know by heart what the diameter of my sliding rods is, but I do know they are quite stiff and made of hardened steel. (The lead screws definitely are not hardened, so make sure they don't add tension by protruding the ledge). Ahh shoot... Accidentally hit the flag button on my last post... Gist of it is, thank you so much for your help so far! I got my 6mm rods finally, and installed them on my X axis (only had time for one axis). Print quality has improved dramatically! however there is still a lot of room for improvement (swapping out to "proper" parts instead of my bodged together stuff). I'm getting weird Z wobble near the bottom of the print that might be caused by "too stiff" X carriage ends (my rods are in there super tight). Will upgrade the Z rods next and see if that improves things before hacking away at my Z top to free up the threaded rods. That's looking great! I'm not even sure if my printer (after two years of wear and tear) is still able to print like that. i think I will soon print a marvin too, so I can compare. I saw tge other question in my e-mai: the bearings are not glued in. Depending on the print they maybe a bit more tight or loose. Slipping out is not normal. If they easily come out they are too loose. I had that problem on my x-carriage after a period of fiddling with the printhead. I fixed it by wrapping some masking tape around the bearing. I ran into a bigger issue where my PTFE tube keeps falling out. I moved the PC4-M10 connector from my hotend to my extruder housing since that's where a majority of the force is, and used a printed connector for the hotend side, however my tube was slipping out and causing prints to fail. The issue now is much worse. For some reason the filament is jamming inside the hotend halfway during the prints. What I mean by that is at some point, the filament fails to extrude causing the extruder gear to grind away at the filament, but it is not immediately obvious as to what is causing this. For example, I can withdraw the filament from the hotend, and shove it back in, and it starts extruding just fine. Since my PTFE tube would work it's way out of a fairly stiff printed connector, I was thinking that the friction in my bowden path may be too high? I was wondering if you could please tell me how long your bowden tube is so I can compare numbers. I'm also thinking that my thermistor may not be calibrated properly and Marlin is using an invalid table (I'm using self-configured 1.1.7) and that at 200C, the hotend is actually at a lower temperature increasing difficulty of extrusion? I will try to wrap tape around the bearing! That is a great idea! Thank you!!! Having the tube pop out is a major issue. On my printer standard nylon tubes with those blue brass/plastic connectors are used. Good temperature reading is essntial. You could try to print the Make: magazine bridge test to see if the printed filament is too saggy. Edit: if your other printer is also a Prusa you could perhaps use that thermistor to check the temperature. (BTW. Those IR laser-thermometers don't work well on shiny objects. Some multimeters can also read temperature with a thermistor). The tube-issues you describe sound familiar. On my printer I had similar issues when it was quite new. I wanted to be able to have a very thin first layer, to get a nice and tightly closed laminate film. Too close to the platform caused additional counter pressure. I also didn't want to print too hot. While hot laminate is very fluid, it can result in droopy prints and hanging bridges. hot-end getting too hot in top of the cooling chamber. The filament should remain solid in and before the little Teflon tube and only melt at the nozzle. If the filament gets too hot too early it can fill up potential hole between the tube-connector and the hollow-screw, jamming the head. I hope these tips are helpful. Good luck! Holy cow, you were correct about the X axis! My 6mm rods came in yesterday, but I only had time to cut and install 1 pair, so that was my X axis. I didn't even cut away the Z top yet! I drilled out the X-end holes a bit and got them in (180mm length), and my print quality improved dramatically!!! It's still not where it needs to be for my purposes (ultra fine printing with a 0.2mm nozzle or smaller), but it's on it's way! I'm still running printed bushings on the Z and Y with undersized (but properly set) Z and Y rods, with one of the Y rods printed in vase mode (LOL) but it's getting there!!!! Top Marvin in the pic was my ABS reference print with the mother printer, and bottom left is before the rods, bottom right is with the rods. Same exact G-code from SD, nothing else changed. Simply amazing! Thanks so much so far! I think next I will cut the Z top since I think the rods are being tensioned in a weird way due to my very stuff X axis rods, and it's quite difficult to adjust precisely. The strange thing is that in the new print, things seem to have more wobble near the bottom of the print and seems to get better as Z rises... could be that the threaded rods have too much strength near the couplers but have more wiggle room near the top. Strong Z guide rods may be a less destructive solution to the issue, so I might go that way first, then cut the tops if it doesn't solve the issue. I noticed my LM6UU bearings are pretty loose in both the Z and X axis... like the clearances in the printed part were too large or something, so they have a tendency to slip out of the X carriage when the carriage is moved by hand. Is this normal? Are the bearings supposed to be glued in? Hello, Good to read you like this printer! I also like it very much and often use it for various purposes. I know the maker and let me tell you about the origin of this printer. It is in fact the result of a bet between myself and the maker. I participated in a Kickstarter for an affordable mini-printer, but they had problems producing it. After waiting for more than a year without receiving that printer, the maker said she could make me one. I replied: that's great, but I need it to be just as small and affordable. She accepted that challenge and the 3Dtje printer is the result. When months later the Kickstarter printer eventually showed up, it looked nice, but was not great at printing. Both the software and firmware were buggy and the quality of the hardware wasn't good either. Cheap stepper motors caused wobbly inaccurate prints. In contrast the 3Dtje printer delivered high quality prints as it used the same software and hardware as the Prusa I3. In fact, I never used my Kickstarter printer anymore and it's been gathering dust ever since. So I know the maker and know she had not abandoned the project as such. She is often on lengthy trips for work at locations where there is no internet (such middle in the Pacific). I have been answering most questions on her behalf so most often there was no reason to reply anymore when fully back online. Nevertheless feel free to remix parts, add modifications and reference the matching components. I believe the license permits such use. To show respect to the maker I suggest you to only put modified components in your remix and just refer/link to the matching original components. Great idea to make the full instructable! I know making it will take quite some effort (which is why it's not been made yet). Please let me know when you've completed it so I can urge the maker to make reference to it. Good luck! Oh shoot, I didn't know you were officially affiliated with the project! This is an awesome history! I'm happy to hear that the maker has not abandoned the project. I tried to search for the parts on the website's store, but all links appeared broken, and there had been no posts on the blog this year so I had assumed it was abandonded. I will definitely post my parts when complete! But for now while I wait for my parts to come very slowly from china (3+ weeks out). I've been downloading/making/printing everything I can (rods, couplers, hotend model) etc, so I can get a feel on how this will come together. If I may, I would like to ask a few questions regarding some concerns I have with the printer. When I printed the Y axis, the screw hole for the Y axis motor that intersects with one of the Y axis rods was partially filled. I would like to know how anyone is expected to get a screw into that hole for the motor since it intersects with the metal rod. When I mocked up my printer with my M5 rods and Z couplers, I noticed that at the current "lowest" Z position (using printed Z axis couplers which are 5mm shorter than the ones I actually bought), the nozzle on my printed E3D V6 hot end is a good 15mm or so away from the plastic print bed. Is this normal? How is this addressed? Using the Z couplers I mentioned previously. I measure roughly 75mm of possible build volume. Is this in line with what you have seen? For some reason I was under the impression that 100mm build height was possible. This isn't a dealbreaker or anything (a bit too late for that lol) but for some reason I got that number in my head. What are the guidelines for a print bed and what is the reccomended way to affix it to the printed platform? My Y axis motor gear, at it's greatest fully supported position still seems around 5-10mm off center from where the Y belt tensioner sits. Is this normal? Are the Z axis lead screw nuts held in by friction? Or are they glued or something? Are there any provisions for keeping the guide rods for the X axis firmly in place? I haven't tried with real rods since mine haven't come in yet, but after assembling everything, I noticed there's nothing really keeping the rods in and they may be free to move about. Do the elongated holes in the Y axis mean anything? Aside from providing a mounting point for the Z axis frame, which I don't believe can move anywhere, was there a point to making this a slot vs a standard screw hole? Thank you in advance for any questions you're willing to answer :) Thanks again to your bet and your friend who created this awesome printable printer!!! 2) an other option to lower the printhead is to shorten the Z steppermotor axel. 8)if necessary you can put ajustement screws if the axels are to small. i was working on a tapered end on the axels for better connection en reducing tension on the Z axes. 9) this was an early disign thing. But later on as decribed it was used for bundeling the wires. hope this anwers som of your questions. This post clears up so many questions for me lol. thank you!!! Well, officially is not how I would call it; it's more that I've got some historical ties to this project, next to being an enthusiastic owner of the printer. However, I'm not the maker, not the engineer, so I can only try to help whenever I can. Ordering parts from China does indeed require some patience. Most times I get my components in 3-4 weeks, but on occasions it took close to two month and by exception a parcel didn't arrive at all. The Y-axis rods are not fixed in place, only clamped by the plastic. The stepper motor screws are sometimes replaced to have different lengths and the one you refer to definitely doesn't reach the axis rod, but seems to be just the same height as the stepper motor. (Don't let the small hole in the side of the bed frame fool you. It may be put there to provide an additional mounting and clamping point if needed). On the plastic top of my bed a small 10x10cm mirror is glued using double-sided tape to provide a smooth surface. The mirror+tape is about 4-5mm thick. My Z-couplers are 25mm long. At the lowest the extruder nozzle-tip is just below the top-surface of the mirror and the end stop screw is used to level the head just above the surface. That build-volume height seems about right. By making the head pass the small ridge and by having a head that's not too high, maximum volume can be optimized. I don't know my exact volume, but I just measured my head to be 70mm high, in between the height from bed to top at about 140mm, so if you got 75mm of space, you're doing nicely! Sorry, I'm not sure if I get what you mean by off-center. I have Nema 17 steppers on my printer. The axis is in the middle. The length of that axis-rod is probably 20mm and the Y-axis geared wheel is mounted with its screw quite close to the end, making the gear (width 15-16mm) extending the axis for about 10mm). On my printer the Z-axis nuts are pushed in, and where needed melted into the plastic using a soldering iron. Normally these screws only support the carriage, on another printer they were pulled loose when the Z-end stop missed target. I fixed it simply by melting additional filament and a soldering iron. On other occasions I've used PVC glue (as used for rain pipes and such) to glue PLA filament at greater strength than the extruded layers, so that might help too. The head on my printer doesn't really do part cooling. For part cooling you could design a modified head. The design doesn't allow for a very wide head, but by using a centrifugal fan you could minimize dimensions. For PLA I got fine results without part-cooling. The X-axis rods on my printer closed in by the plastic. The holes on both end-sides of the X-axis are a bit filled with printed filament, so on the inside they were probably drilled out to provide a tight fit. On my printer those elongated holes in the Y-frame each contain two screws connecting both Z-motor-mount and the mid-plate. In addition to that a tie-wrap is going through which is used to bundle and tie the wires going to the feeder and y-axis motor and to the y-end stop. BTW my wires are put in mesh wrapping before tying them to get a less messy result. Again, I may not be able to help you fully, but I've tried. Hopefully these answers were helpful to you and it would be great if other makers could add their help too. Thanks for your tips!!! Very few helpful! Most of the parts are in! I just need rods, and the Bowden tube to start working on the final build! Sure, why not? It may require some changes in the design of some parts due to the different dimensions, but that's something you'll figure out when building this printer. Like most Prusa I3 printers, this printer uses a 12V supply. My printer is 150mmx150mm, parts doesn't fit, could you provide the parts in a format I can open in solidworks 2014, so I can redesing ? I promise I post to everyone, after redesigning it. I'm not sure if all parts can easily be split up into sections to allow printing on a smaller printer. Some parts will easily fit, but the larger (such as the frame and the bed) would probably require additional design features such as extra holes to allow combining them from multiple sections. Unfortunately I don't have the source files, but whenever I need to print something big, I use Slic3r to print sections of the part. Using Slic3r you can split the component and export the parts to an STL file for further editing. Good luck! Weird! I saw your picture. The .stl hasn't changed for a long time, so it must be something else. Perhaps it is a setting in your slicer? Some software allows you to scale printout in various directions. Did you compare sizes and hole positions of the Mega board? Maybe you have a clone with deviating hole distance? Did you compare outer size of the printed part? If the whole part prints differently maybe your printer is off. You can then test accuracy of printed dimensions using a self drawn calibration piece. Maybe your belt is worn causing it to deviate? That mostly depends on where you buy the parts and on their quality. If you order locally delivery is fast, but prices are often 4 times as high or higher. Cheapest is to order parts from China, but you may need more patience and be lucky with the quality. At the time mine was built I think the price of the parts was about 350 euros. Prices of readily built printers and kits have dropped quite a bit, so maybe now you can get them for less than 200. The effort of searching and ordering parts is part of the fun! ;-) So enjoy! Good luck and don't forget to post pictures of your printer when its done! It attaches using the same technique as used on the x-axis. Both ends of the belt meet each other at the bottom of the bed (or backside of the extruder mount). There you find slots for each end. By folding the belt-end around a pin back and interlocking to the earlier piece of belt into the slot, you create a sturdy yet adjustable attachment that cannot easily be pulled out of the slot. However, make sure that the slot is cleaned out and wide enough to fit the thickness of an interlocking piece of belt. In case the loop-pin didn't print properly (too messy or too thin), you can break it off and fill the loop of the belt-end with a piece of filament. Hi Andy, I just added a close-up picture of the bed belt mount on my printer, see here (https://www.thingiverse.com/make:314733) . I briefly compared my part with the current one, and it doesn't seem to be different. Ar I get it now. Yer I was thinking there was meant to be posts in there. I'm thinking of changing to a clamp system for it. Also do u have an email I would like to send u afew pms. I wonder... does anyone actually know what those nut holes are for? I've asked Newtonn2 but he's not sure either lol. Those holes were intended to place little screws for manual bed-leveling, but in practice they most often proved not to be needed. On my printer the bed is a 10x10cm mirror that is attached to the bed using double sided tape. Whenever I print something I first print a few loops of priming lines around the object and then feel using my finger if its thick enough on left and right side. On the occasion where one side is too thick, I just adjust the Z-axis stepper by force while it's printing. That may require you to change the design of the bed. I used SketchUp to modify another part (see https://www.thingiverse.com/thing:2250966). I found it easiest to first erase al triangle lines on the flat surfaces before making my modifications. What error do you get when? Do you get it when uploading or when running? Arduino: 1.8.1 (Windows 8.1), Board: "Arduino/Genuino Mega or Mega 2560, ATmega2560 (Mega 2560)"
Hmmm... my comment vanished after using Markdown to format the output. I've just now tried this with a bare Mega 2560 board and now it uploads just fine. I didn't upload it to my printer, but did try the serial monitor (@115200 baud) which gave proper output. Thanks, I just used an older ide and it worked thanks for the help. Also I have found that the holes for the 3.1-012_top_z-as don't line up with the standing plate holes. The middle one lines up but the rest are out by 1mm or more. The standing plate holes line up prefect with the 3.1-040_hinge. Was also wondering if u had the original files so I can modify afew holes in the standing plate. importing you use the eraser tool to remove all triangle lines from the flat surfaces. Although it takes time, once surfaces are cleaned up it's quite easy to remove a hole and draw a new one, or alternatively stretch/shrink the sides according the required modification. I found SketchUp fairly easy to learn and know that the parts of the 3Dtje mini-prusa were also drawn using SketchUp. to make parts fit tight yet tensionless. You're welcome. Good to read that it works now. Sorry, I don't have any original files. My printer was made using earlier files that weren't perfect either. However, the new files should be better. In some comment I read that parts are not symetrical and that some alignment problem may occur when you reverse the item. Have you looked at that? What I would do in such a case is to import the .stl in SketchUp to have a better look, measure distances and if needed to adjust the object. Most .stl's can be easily adapted if after importing you use the eraser tool to remove all triangle lines from the flat surfaces. Although it takes time, once surfaces are cleaned up it's quite easy to remove a hole and draw a new one, or alternatively stretch/shrink the sides according the required modification. I noticed that depending on the printer, dimensions in one direction can be different from the other direction. To measure this you can draw and print a 10cm strip or other calibration piece. In my printer some manual rework was needed to properly align the display to the frame. I measured the distances in the .stl and they were correct, so concluded that the printout was not entirely 1:1 in x:y directions. Finally, don't be afraid to do some manual rework. Most holes still work when slightly enlarged using a drill or soldering iron. Use a knife or file on the edges when needed. Some edges wont print perfectly flat and will probably need some rework to make parts fit tight yet tensionless. Hi, I've just completed my build of this printer. Very pleased with it - but i'd like to modify a few parts (strengthen the Y axis main body, improve the Y axis moving bed endstop, improve the Z axis endstop etc). Can i ask - what program was used to develop this printer? Would you be willing to release the design files? The printer was designed in SketchUp. I don't have the design files, but it's fairly simple to import the stl files and modify them. I just did so today when part of the extruder lever broke off. Using SketchUp I first removed all triangle lines from the flat surfaces to make the part easier to modify. Then I added some ruler lines and drew additional lines to created the new surfaces needed to widen the part at the place it broke. Finally I cleaned the drawing up by deleting old lines from the surfaces and by navigating into the internals of the part to remove all internal surfaces that were no longer needed. Not done much with Sketchup recently. I'll give it a try. Thanks for the advice. Super project, i would like to build it but I have a short question, witch extrude system are you using?? See below: " a Jhead E3D hotend/extruder is used with bowden tube filament transport." do you have a complete list of materials, as i could not fint any on your webpage "http://3dtje.nl/en" you told others in the comments. The x-axis rods where not easy to see, so that measurement is less precise. From what I read a Jhead E3D hotend/extruder is used with bowden tube filament transport. Was there a current website with a link to the bill of materials needed and build instructions? I tried going to the one in the comments below but get a 404 error. I have a few kids in an afterschool program that would like to try making a few of these.. I'll have a look into it this afternoon. Hello! I was curious if you guys have a video of how to assemble this printer? Im not at this point yet but i can't wait to finish this thing! It's a very impressive design! im having a problem with the 3.1-021-1_bowdenmount_part_b part. It's not printing out properly. im not sure whats the problem with it. I'll wil update the file later this afternoon. If you open it in slicer how does it look. Or do you have physical print problems. When I use Cura it looks okay, but when I begin the print it works well for several layers then decides to skip a couple and continue several millimeters in the air. After that I used the makerbot software, again it looks okay, however when I do preview print it appears to resemble as if a hotknife went through it. For curiosity's sake I tried printing it again. The piece didn't come out properly sadly. Sounds like a corrupt file. I'll update it anyway later this afternoon. Slic3r has an option for repairing stl files. Perhaps that is a solution. Otherwise you'll have to wait fot the updated file. I used slic3r and hopefully it will work. Piece is printing as I speak. Will update soon! i've updated the files, there are slight different. these have an possibility to t-wrap the cable from the heater and thermistor to the mount. Also, this looks like a great project, I'm probably going to build one for myself. Hi. Thanks for all you hard work in designing this wonderful printer, which I'm hoping to start building soon. In your shopping list of part you mention a 50cm M5 threaded rod & a 120cm 6mm Hardened Chrome rod. I'm assuming that these need to be cut to required lengths (the threaded in half, so 2x25cm lengths). I was just wondering what lengths the 120cm 6mm rod needs to be cut into for the X, Y & Z axis's, as I couldn't find any mention of it (although I might just be blind/lazy or both. Lol)? did you find out how long the rods needed to be ? Have a look at our website www.3dtje.com you'll find al the details of the materials used. Hi karl, I don't have any STP format files. I only use stl format. which drawing program is commonly used to export STP files? Basically any software other than blender or openscad, what software do you use as native? Hi There! I love this printer! I would like to make one myself. Do you have all the issues solved? Are all the files been updated? Please let me know, I can't wait to start printing the parts for this super 3d printer. Hi Newton, You can build the printer with little to no problems. Its a pretty straight forward design. but if you encounter any problems don't hessitate to contact me ([email protected]). I'm alway happy to helpout when i can. These printer are already printed in sweden, spain, poland, usa. every time somebody pops up an idea to improve it i'll certainly give it a try. now i'm working on a heated bed version and a improved cooler. kind regards and happy printing. I have mine done and I also made a heat bed so I'm printing ABS. I will be posting some photos soon. Thank you for sharing this primer. Ps: If you release the design the community may help to fix some issues that I found while building this printer. But overall I'm very happy with it. Hi again, I just found an issue. To holes on the 3.1-012_Top_Z-as.stl does not aligned with the holes on 3.1-002-2_standingplate.stl. you have to check if you printed the 3.1-002 of 3.1-002-2 print from a later date. I've deleted the old file but it was still on the parts available. the latest version should not have the alignment problems. iv just printed the top_z-as.stl and the holes are still not aligned there out by about a 1mm. The middle hole and the other two on the left align perfectly, the remaining two holes on the right don't align. I may be able to drill it and use it once I have the rods in place. Just letting you know in case there is an issue there. Do you have a list of bolts and sizes? just visit 3dtje.nl and a partslist is available. I did try to limit everything to M3 in variable lenghts. exeption is the m5 rods for the z axis. I'll have a look at that one, but please keep the alignment of the print in the same direction. sometimes when you change the alignment for example standingplate left to tight in the x direction and for the top Z in the y direction you can end up with differences. That's very cool! I was thinking on trying to do a mini heated bed as I wanted to use it to print ABS. Would the design change a lot? I'm already printing this one and will post images as soon as I'm finish. How is the quality? do you have a sample of something you have printed with it? Thank you for your message an we do apologize for your troubles. Although this isn't the most simple thing to print, I agree that for a successfull build, the holes should match. Thank you for pointing out the mistake and perhaps you can assist us in finding which files don't match? At first look I couldn't find the mismatches in you are referring to. Then I looked closely at the standingplate versus the Z-axis support (bottom right side) and imported the STL's from thingyverse into SketchUp. The top two holes on the right side have their centers 37mm from the bottom and are in the standing plate 31mm apart from each other. However, in the support part the holes were only 30mm apart! Is this the mismatch you are referring to? I do think you are correct and that this needs to be improved. We have build many mini-printers ourselves and it could be that the hole distance was never much of an issue because we often use a 3,5 mm drill to widen the hole, and in combination with the 2.8mm screws we never had troubles fixing these two parts together. Edit: I just found a newer version of the file, which has the proper distance! Version control seems a bit off and I can't seem much of it in Thingyverse. I will see if I can upload that later version. Thanks again for pointing out this mistake. Edit 2:I uploaded newer versions of both left and right lower Z-axis support parts (both had incorrect hole distance of 30mm instead of 31mm). @314159td: Do you know of any other parts that have an incorrect distance between the mounting holes? Together with Lisette I need to look into this further. Unfortunately Lisette is currently unavailable, so it may take some time before we can fix this. When she's back I will also discuss your request and that of @tolar250 regarding the release of the source files. Yes, that was the mismatch. At first, I thought it was because my Z axis E-steps were incorrect (from the factory), but even I recalibrated the holes didn't seem to line up correctly. I've gotten so used to press fitting 3d printed parts, I didn't even think about drilling out the holes. So far I haven't found any other issues, but I'm only part way through the assembly process. Edit: Sorry about the long response time, I left for vacation literally the day before you posted. Have you considered releasing the source files to allow for editing? I would be willing to share any improvements that I create if you do not object to it. I'm assuming that the holes were moved in a new version of one of the parts, but that change was not made in the part it interfaces with. Any chance CAD files in stp format will be released? Where can I find all of the exacct non 3d printed parts? Hello. You can find a shopping-list on our website (http://3dtje.nl/en). See the submenu under "Building your own printer". Most of the electrical and mechanical parts can be obtained at a good price in exchange for patience from Chinese suppliers. If you want to start building as soon as possible you can try local suppliers. hello, do you have some documentations on how to built the Printer (from A to Z) ? What are the size of the rod and the dimensions ? If you can share some pictures or some link with all the details it will be great. I have printed all the parts and now i want to go forward. there is a bill of material on the website www.3dtje.com. the parts are pretty straight forward. But i'll try to add some pictures of the build. best thing is te start with the Y-ax and bed. then I normally build the X-ax. the sizes for the rods are 157, 182 and 200 mm 6 mm chrome hardend. see how this works out, and when you're ready send me a picture for the hall of fame in the Micro-factory Scheveningen Netherlands. Thank you, i will post pictures when it will be finish. Could you send me one? Do you mean you want to purchase a completely assembled mini printer? Depending on your location and payment options it may be possible to ship a printer to your location. Please send an e-mail message to [email protected] with your information so I can see what's possible. ich würde auch gern versuchen diesen Drucker zu bauen. Sorry for the late reply. You need a 20cm x 20cm sized bed to print the larger parts. Is there any possibility that you can upload some explosion files or a CAD file to better understand how its put together? I have a one question. Can i use my 2.85mm Filament with this printer. Which Extruder should i take? Can you upload some more pictures? For that size filament you need to make a few adjustments to both hardware and software. All builds so far were for 1,75mm filament, so I can't give you much advise on that. In addition to an extruder with wider opening, you also need a different sized wheel in the filament feeder and a wider tube. Secondly you probably need to adjust the default settings in Slic3r and perhaps also in the firmware. Good luck building your version of this printer and please post the results here! hi, am I going to be able to print all parts on a flashforge creator? thanks a lot! Unfortunately I don't have experience nor access to a Flashforfe Creator. If the bed is at least 20cm x 20cm you should be able to print the largest parts. Most smaller parts can also be printed on smaller printers. @All: sorry for the delay in replying to your messages. Unfortunately Internet access isn't available when sailing the oceans, so please be patient if you don't get a swift reply to your message. Other readers are invited to reply to messages if they know answers to questions. You print without heating bed system ? what is your tip for best adherence to the bed ? I use blue maskingtape from tesa, special for outdoor use. I've also tried with the normal masking tape but they do not give a nice finish for the firstlayer. make sure you level the bed properly. most of the problems comes variable first layer. I use 0,3 for the first and 0,25 for next layers. Do you think we can use Nema 14 motor for this printer ? I've tried the nema 14 myself. they were a bit harsh to ajust with the A4988. So I'd stick to the Nema 17. Good luck and let me know if you succeed. ive uploaded a new file, also made some changes in the drawing so problably cura will also read it fine. really thanks , new file work perfect. How huge are the build dimensions? Hi, the "biggest"object you can print with it is 90x90x75 mm. most of the things you need you probably can print with it. Thank's a lot for your fast answer! Unfortunately the bowdenmount part b file appears to be defective, the slicer only displays half of it with missing layers. has this problem anyone else? never had any problems with the drawing, but i'll check it and will upload a new file. I have not been able to get the firmware to upload to the Mega 2560. The arduino ino file is not working correctly and I keep getting an error when trying to upload the file. I used gt2 belt and used a twrap to connect the ends. The remaining ends are folded back and this is pushed into the opening of the bed. I'll put a picture and close up online. Hi milt, the files for the feeder unit is included. I 've used a mk7 gear and a small gearing 688 2z 8x15x5 mm. Two pnuematic connectors, A spring and screw to apply some pressure. Again, sorry. I did not see the feeder file when I began printing. I see it now. Many thanks for the rapid response. Feeder is printing as I am typing. Nice little printer that you have designed. Not too sure what I am going to do with it when it is finished. But, I just had to build this one for some reason. Just need to get the bearing, and electronics and it will be done. Sorry, I am talking about the mechanical extruder itself, not the hotend. What one are you using and where on the unit are you attaching it for the best push through the bowden tube? Hi milt, i used an j-head and i believe it is an E3D V6 aluminum. 30-40 watt element. My Mendelmax 1.5 is quietly printing away. Glad I have a good sized plate. I have printed everything on a 20-20 plate. latest addition: i've added the arduino firmware for this printer. Say thanks by giving 3Dtje a tip and help them continue to share amazing Things with the Thingiverse community. mini 3D printer (3Dtje) by 3Dtje is licensed under the GNU - GPL license. Say thanks and help 3Dtje continue to share amazing Things with the Thingiverse community. You'll need a PayPal account to tip 3Dtje. Click the button below and you will be redirected to PayPal. Once the payment is complete, you'll be brought back to Thingiverse.